Mountain biking is a year round option. A section of the track from Ship Cove to Camp bay is closed off to bikers from 1st of December through to 1st of March, but from Camp bay to Anakiwa is still open all year round. 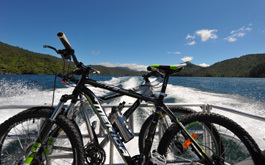 We can transfer you and your mountain bike to any part of the track whether it be a day ride or the full experience. © 2011 Copyright Picton Water Taxis. All rights reserved.